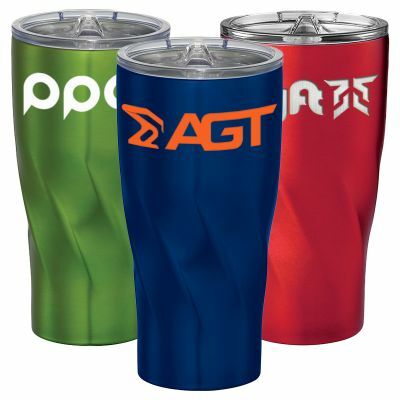 Insulated metal tumblers have always been a rage during outdoor events and activities. Everyone will love these attractive and sleek bottles that will keep the beverages fresh and in the desired temperature – hot or cold for a long time during game days, picnics and camping. Made of double wall stainless steel with copper lined vacuum insulation, these tumblers can retain hot or cold temperatures for hours! Drinkware items are one of the top 5 promotional items in promotional industry. Everyone needs these stylish items to carry their favorite beverages and to relish it in style wherever they go. Drinkware items enjoy a very high retention as well, which means your brand imprinted on these logo items will get a consistent impression for a long time without any repeat effort or investment. Great for carrying your favorite beverages to office or on the go, they make a stylish addition to the coffee tables as well. Offered in various attractive colors, these tumblers will make a great canvas for marketers to place their logo or message and to reach out to their audience. 20 Oz Hugo Copper Vacuum Insulated Tumblers (PI351856) featured in this video stand out for its trendy geometric spin near the base; available in the color choices of Black, Blue, Copper, Graphite, White, Lime, Red, Silver, all with clear lid. These tumblers feature a stainless steel, double walled vacuum insulated design with copper lining for maximum temperature retention. These drinkware items can hold beverages cold for 24 hours and hot for 8 hours. Get your logo imprinted in one color, two colors, full color wrap or get it laser engraved to create the best impact among your audience. Push-on two piece lid with Tritan™ swivel anti-spill closure with a drink-through opening. The two piece design will make it easy to clean the lid after use. These tumblers make perfect giveaways during outdoor events, corporate picnics and employee appreciation events.